For a few months I’ve been trying to find my art inspiration for a quilt of Red Rocks from the US southwest. The colors and textures of these incredible rock formations are perfect for art quilts! I’ve seen several other renditions from artists which are very realistic…not at all my style. I made some small art quilts of red rock formations which I like but still felt they were not exactly the direction I wanted to go. I recently sold a quilt which was curves and color in a style I had not returned to for awhile and suddenly I was hit with inspiration! 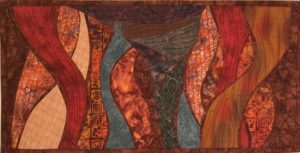 Why not make a red rocks design similar to this design with overlapping curves of distinctive fabrics?! I immediately set aside a half finished art quilt and dove in…strike while the iron of creativity is hot! 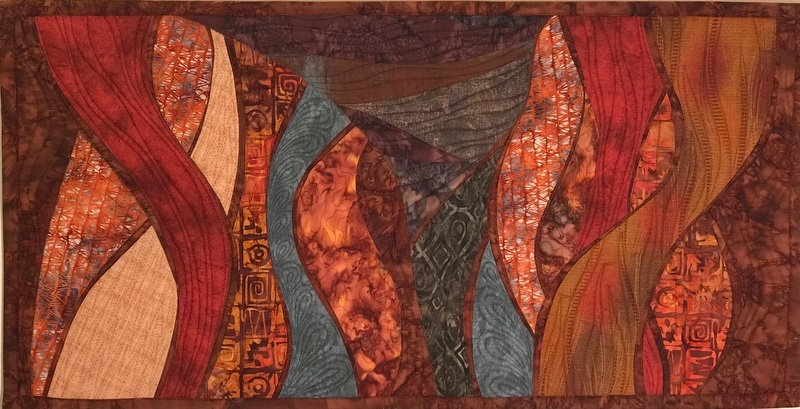 The quilt I created is shown in this blog….a very abstract, curvy, sort of whimsical interpretation of the red rocks I saw in Arizona years ago. It is color and crazy movement and some depth created with fabric colors and with overlapping composition. What I learned is to listen to my more creative self and try something that is different.